Signs of forward movement on a critical gas pipeline could be derailed by border attacks. A dozen villagers from Balochistan’s Kech district protested recently in front of the national press club in Quetta, the provincial capital, over an “unprovoked attack” by Iranian border guards in the Kech area of the troubled province. The protesting villagers, who live close to the border with Iran, said that they had been trapped within their homes, frightened by heavy fire from Iranian border guards. In the village of Zamuran, on the edge of the Goldsmith Line, people were confined to their houses because of heavy Iranian firing, the protesters say. “We are terrified. We can’t go to our working places and schools,” Mohammad Hanif, chairman of protesting villagers told The Diplomat during the protest in Quetta. Hanif said that at least 42 rockets were fired by Iranian security guards into the Zamuran area of Balochistan’s restive Kech district, wounding at least seven civilians and spreading fear and uncertainty among the villagers. He said that Iranian border guards started firing the rockets around 4:00 a.m. and stopped at 10:00 a.m., claiming that the rockets were fired into the civilian population from very close range. A large number of houses and shops in the area were turned to rubble due to the heavy firing. The victims were taken to the district hospital in Turbat for treatment. Habib, who travelled 1200 kilometers to Quetta to attract the attention of provincial authorities, added, “We will go back if only Balochistan government ensures our security otherwise.” He noted that there had been a constant movement of Iranian border guards near the border. “We and our children are not safe in these conditions, we want peace,” he said. Residents of villages of Pakistan’s Balochistan province living near the Goldsmith Time have several times reported heavy firing and heavy shelling coming from the Iranian side of the border. Officials from Panjgor and Kech districts say a large number of families have been compelled to flee their villages to escape the rockets, which have injured dozens of civilians over the past month. Pakistan’s national media have regularly carried reports of Iranian border guards entering Pakistani territory in raids against militants. The reports have created anger towards Iran among Sunni religious parties, who see the raids as an attack on Pakistani sovereignty. The anger is being expressed everywhere from Friday congregations to Twitter. The protesters outside the press club in Quetta pledged that if the cross border attacks don’t stop they will take their protests across the province. A provincial minister, who wished to remain unnamed, told The Diplomat that the Balochistan authorities would protest formally to Tehran against the latest incursion. “Chief Minister Dr. Abdul Malik Baloch is in talks with the Iranian authorities in this regard. If our bilateral discussion regarding this issue brings no result, we will refer this issue to the federal government,” he said. According to sources, the rockets were allegedly fired in retaliation to an attack by militants on an Iranian checkpoint in the Koh-e-Sor area inside Iran that killed three Iranian officials. An Iranian border official claimed that the gunmen fled back into Pakistani territory, although Pakistani officials have denied this claim. In November 2014, the Foreign Office of Pakistan lodged a strong protest with Iran, after the neighboring country’s border guards stormed into Pakistani territory and killed a security official. Security on both sides of the border has tightened in the aftermath of deadly attacks carried out by Islamist militants of Jaish-ul-Adl, (Army of Justice), a little known Islamic militant organization that accuses Tehran of sending members of its elite Revolutionary Guards to fight the opponents of President Bashar al-Assad in Syria. Pakistan and Iran, which share a porous 900 km border, have recently agreed to tackle the terrorist threat along the border. Sources in the Balochistan Home and Tribal Affairs Department said that the two countries have decided to joint forces to fight terrorism, narcotics, and human smuggling. They have also pledged to bolster trade with the help of Chinese multinationals. This latest rocket attack on Pakistani territory by Iranian border guards coincided with suggestions of movement on the long delayed Iran-Pakistan gas pipeline project. Media reports in late December suggested that Pakistan has convinced Iran not to invoke a penalty clause for the delay in Pakistan’s section of the pipeline – attributable to the international sanctions on Iran – although Iranian Oil Minister Bijan Namdar Zangeneh subsequently denied this. Iranian President Hassan Rouhani is nonetheless scheduled to visit Pakistan soon, with indications that negotiations on the pipeline are moving forward. The project is projected to initially bring 750 million cubic feet per day of gas at an estimated cost of $13 per million British Thermal Units.. According to a source from the Ministry of Petroleum and Natural Resources, the Pakistan government is planning to complete the project in two stages. In the first stage, the government will build an LNG terminal at Gwadar Port. This will be followed in the second stage by a pipeline running 700 km from Gwadar to Nawabshah for onward transmission of gas to the northern parts of the country. Pakistan approached Chinese authorities after its failure to lay a 781 km pipeline from the Iranian border to Nawabshah. “Now we have decided to build the pipeline from Gwadar to Nawabshah in partnership with China,” the ministry official said. 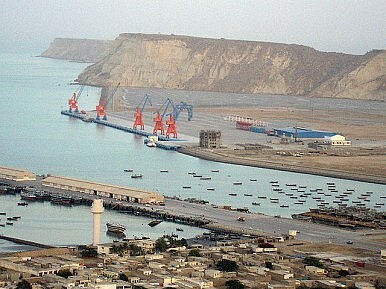 Baloch separatist organizations are also opposed to mega projects of this kind in their province, seeing them as exploitation. However, the surge in attacks by Iranian border guards – and the associated anti-Shia anger – could pose a more immediate threat to the project. New Trends in Pakistan-Saudi Arabia TiesTrouble at the Pakistan-Iran BorderBaad: A Cruel Tradition in BalochistanThe Challenging Geopolitics of the Port at ChabaharIran-Pakistan at the Crossroads?